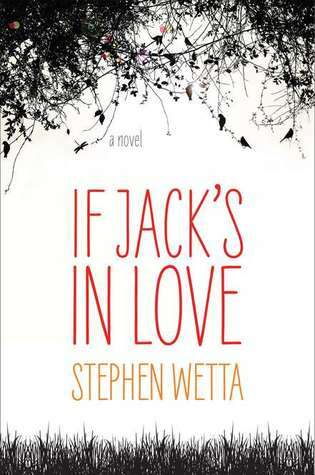 If Jack's in Love is author Stephen Wetta's debut, a bildungsroman built on the foundation of two romances, both of which are varying shades of Romeo & Juliet. It's the story of two brothers living disparate youths in the same broken down house. The house, a shambles, is a visual representation of their family life - falling apart, screens missing, trash piled up against the side that never gets tossed, only sifted through and reorganized. Wetta, in the afterword, says that he wrote this as a kind of homage to a boy from his youth who lived in a similar home - I think every neighborhood had a family like that. Taking place in the South in the 1960s/70s, these lovers are surrounded by the omnipotent (and, in the novel, specific) force of social clashes, as well as the less specific (and disappointingly under-developed) racial tensions. Wetta hints at the racial divide (i.e. Gladstein living in a black ghetto, Dickie Pudding's father being a member of the KKK), but never fully develops the implications of such. Part of this surely has to do with the narrator being a twelve-year-old boy whose focus is more on his hormones than anything else. Twelve-year-old Jack Witchers’s brother Stan, however, has always been violently indignant about his social status and ready to confront the world about it. His arch nemesis is Gaylord Joyner, crown prince of the Joyner clan, a family whose status is perhaps not too high above the Witchers, but high enough that a deep, dark ravine separates them. Gaylord Joyner’s younger sister, Myra, is the subject of Jack’s love. The pair make up the first set of Romeos and Juliets – theirs is a fast-growing, innocent kind of childish love, tormented by their social disparity and familial hatred. They are the star-crossed lovers, represented in light and air and magic. Their love marches to the beat of Myra’s awkward hopping-walk, in contrast to the hum of Anya’s GTO – the beat of Stan and Anya’s romance. Stan and Anya are an older Romeo and Juliet: wiser on the surface, certainly more socially-conscious, but that wisdom and consciousness is somewhat poisoned by their lazy notions about love and responsibility. Theirs is a different kind of passion, violent, instantaneous in its growth. As the close of the book will suggest, the story is written from Jack's perspective some years later, after the tragedies and the dramas of his youth have passed. But Wetta still manages to be loyal to young Jack, allowing him a childlike honesty akin to Tom Sawyer's, but with the benefit of the adult reasoning - making it more adult than young adult. But all-in-all a successful tale of love and death and everything in between.